The letter of the federation’s treasurer Adrian Siegel published on FIDE website, states that the Swiss UBS bank is ready to close FIDE account in the near future. Even third-party observers immediately noted a number of inconsistencies. First, the sanctions against Ilyumzhinov were introduced by the US Treasury in late November 2015, but for some reason this did not prevent the bankers from serving the federation for more than two years. Nevertheless, some media seized on Siegel's message. Since the bank did not comment, journalists of some media simply broadcast the message of a misleading letter published on the FIDE website. In this regard, we publish here a Newswire, which lawyers of the London based law firm W Legal kindly provided us. 1. Mr Ilyumzhinov has been informed that FIDE’s bank account with UBS has not been frozen as alleged and that such account in fact remains open today. 2. Public documents released in 2015 by the U.S. Department of Treasury do not allege that Mr Ilyumzhinov has been sanctioned by the US as a result of him conducting oil deals involving ISIS. 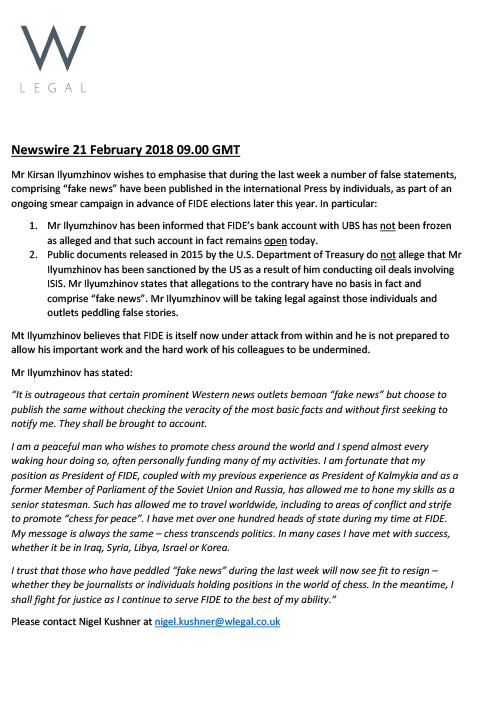 Mr Ilyumzhinov states that allegations to the contrary have no basis in fact and comprise "fake news". Mr Ilyumzhinov will be taking legal against those individuals and outlets peddling false stories. Mr Ilyumzhinov believes that FIDE is itself now under attack from within and he is not prepared to allow his important work and the hard work of his colleagues to be undermined. “It is outrageous that certain prominent Western news outlets bemoan "fake news" but choose to publish the same without checking the veracity of the most basic facts and without first seeking to notify me. They shall be brought to account. I am a peaceful man who wishes to promote chess around the world and I spend almost every waking hour doing so, often personally funding many of my activities. I am fortunate that my position as President of FIDE, coupled with my previous experience as President of Kalmykia and as a former Member of Parliament of the Soviet Union and Russia, has allowed me to hone my skills as a senior statesman. Such has allowed me to travel worldwide, including to areas of conflict and strife to promote "chess for peace". I have met over one hundred heads of state during my time at FIDE. My message is always the same – chess transcends politics. In many cases I have met with success, whether it be in Iraq, Syria, Libya, Israel or Korea. I trust that those who have peddled "fake news" during the last week will now see fit to resign – whether they be journalists or individuals holding positions in the world of chess. In the meantime, I shall fight for justice as I continue to serve FIDE to the best of my ability. " Editorial note. We just received a message from London lawyers: the Swiss bank replied that it did not freeze any FIDE accounts and is not going to freeze it. So let's say to FIDE Treasurer using the words of the great writer Bulgakov: "Congratulations, you're a liar!"